Oh my goodness, what a precious wedding card. I love it to pieces. I have to get over to the Etsy shop. This is sweet, Lynn! I love it! This is fabulous Lynn, love the embossed background and gorgeous image. I really, really, really like this card! As someone said in a comment above mine...It's a perfect wedding card! So very nicely done! 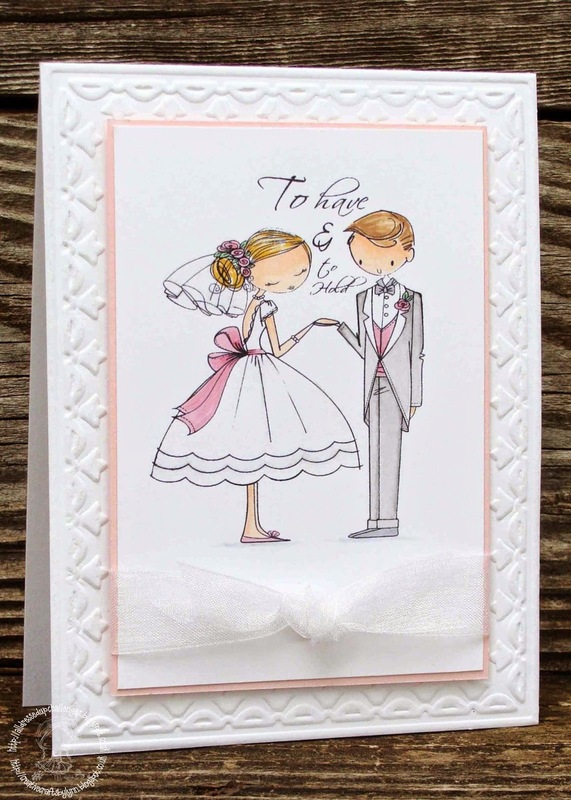 Awww what a sweet wedding card, Love that image and the touch of shimmery ribbon !! Beautiful card and delightful image! Love the little touches of pink, just perfect! Love this sweet wedding card! Beautiful work, Lynn! How cute, beautiful, and what a keeper for the lucky bride and groom album. Gorgeous wedding card Lynn! I love that image and the soft coloring!! OMGoodness, Lynn, you make even CAS wedding cards look spectacular! Love that the coloring is minimal. Fab job on the tux. Coloring in grays can be really difficult but you nailed it! Fab embossing folder. This is beautiful, Lynn!! I really love the soft coloring of the image and the embossed frame background is perfect to showcase it! Awwe, what an adorable image, Lynn. Very pretty card and I like the embossing and the subtle organza ribbon. Lots happening at our end... we move to Singapore next month and we have decided to look for a home once we move in there. I should be sending you an email but life is getting a bit hectic. Hope you and hubby are fine. 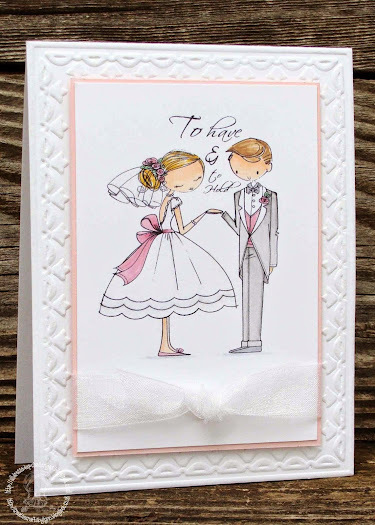 This precious card just makes me realize that CAS cards are perfect for weddings! I love how you put this together, and the knot in the ribbon almost looks heart-shaped! Great card! Oh wow... you really rocked this card Lynn! It's fabulous and your CAS style suits this perfectly! Going to go pin this little beauty to the All Dressed Up Pinterest board right this very minute! Fabulous card for a newly married couple. Love the embossed background and the organza ribbon to tie the knot. What a sweet wedding card, Lynn! I'll bet that dress shimmers like a wedding dress should! Love the font of the sentiment and the tiny bit of color! This is the cutest wedding couple ever...such a beautiful card, Lynn!!!! This is beautiful! Such a sweet card!